About six months ago, 12-year-old Harry Lee contacted me via email. He said he found the “Spangler Science” section on 9NEWS.com and started his own science club in Indonesia. Harry watches the experiments on his computer and then re-creates the fun with his club. Over the past few months, Harry and I have exchanged emails and even talked on the phone – I could tell that there was something special about this young man… he was amazing. I received a call 3 weeks ago from Harry – he was attending the Summer Institute for the Gifted (SIG) at Amherst. I told Harry that I’d love to see him if he ever makes his was to Colorado. The phone rang later that night… it was Harry Lee. “My parents would like us to meet… so I’m coming to Colorado on August 29th.” WOW! I told Harry that I’d like to have him as a guest on 9NEWS to do one of his favorite experiments. Today, I meet the Lee’s for lunch – Harry, his sister Alexandra and his parents Lilly and Keat – and I know I understand why they say, “Great kids pick great parents”. After spending the afternoon together, I know that the world will be a little better off someday because of Harry, Alexandra and the Lee family. It was great to have Harry and Alexandra as guests on the 4 O’Clock Show… and it was great to have made some wonderful new friends. Watch Harry and Alexandra amaze you by viewing the video on this page. Thank you so much for the great time, thanks for taking us to lunch and the tour of the set and your warehouse. IT was DEFINITELY worth bringing the whole family to Colorado. Please convey our thanks also to the producer and other staff members who had helped make the segment possible. I’m one of Alex and Harry’s best friend. Me and Alex went to the same school and we always hang out with our other friends. I have to say it was amazing to see her in tv. You might have guessed, but I live in Indonesia with my Indo mom and American dad. Wow Alex..and Harry…amazing!! We all JIS ppl miss you!! Harry and Alex – It was great to have you in Colorado and to get to spend some time with you and your family. Great job on television – you’re welcome back any time!!! Thanks Steve! By the way, have you recieved my emails? My email account hasn’t been working too well lately, so they might not have reached you. Thanks very much for having us! That afternoon was truly amazing, and one that my family and I are going to cherish and remember forever. Congratulations Harry! The Indonesian Fun With Science club did not start this semester, for some reason….. However, it WILL continue on in the second semester. You will not regret putting me and Brooke in charge since you left. Simple, but a very cool experiment. I hope science clubs get more popular in different school in different parts of the world. It’s great experience to see some of the phenomenons of the world. 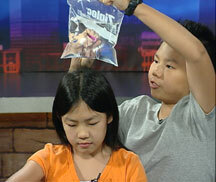 It’s really great that you got to do an experiment on 9NEWS. I’m really happy for you, Harry! Alex goes to my school, and yeah. Hi Steve! My sincere apologies for not keeping in touch over the past year; life has been very busy. I have since moved to Australia and am now attending Year 10 at Scotch College. After many long talks and some pleading, I have managed to start a science club here, which will commence in a month or two! Thanks for being a fantastic source of scientific entertainment, and for the experiments you provide on this website. I’ll definitely be doing them this year!